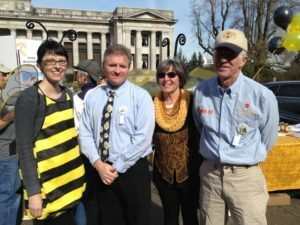 We can make Washington a better place for bees by improving how the state treats bees and beekeepers. To do so, we need to reach out to all legislators with each of their beekeeper constituents to contact them. WSBA would like to compile a list of all beekeepers in the state, and to place each beekeeper in his or her legislative district. With such a list, key legislators can hear from their own constituents about the importance of bee issues. Often, groups try to influence legislators by mass email/letter campaigns using copy-and-paste identical messages. Those don’t carry much weight. But individualized messages from their own constituents do. Besides the House and Senate Agriculture committees, bee bills were heard this past legislative session in the House General Government & Information Technology, Rules, and Senate Natural Resources & Parks, Ways & Means, and Rules committees. That’s a lot of legislators to help understand the importance of bees to the state ecology and economy. And every bill gets voted on by every legislator when it reaches the floor. A central list of beekeepers, and who their legislators are, would be very helpful in reaching those legislators who can make a difference in favor of bee legislation and are on a committee assigned to hear testimony and vote on a bill. If you are already active in talking to your legislators, good for you. Please send your contact info and I can keep you informed about events and up-to-the-minute status of bee-related legislation. Let me know if you’re interested and you can be a part of the WSBA legislative committee, too. If you’re not politically active, don’t worry. I can help you reach out to your legislator. They don’t know about bees and what’s good for them, you do. Each of us can communicate those ideas to them and cause change. You may be nervous about calling or emailing your legislators, as I was. I find that mostly they don’t reply at all, or reply with a generic “thank you for reaching out” email or letter. The impact of your message to them will be “I see my constituent wants this bill to pass. If I don’t hear anything different, I will vote for it.” If they actually email or call you back, count yourself lucky. If that happens, their assistant will want to know what the legislation is about and why it’s important. Their time is limited and they almost never want to go into detail. If you’ve taken the time to email or call, you’ll know enough to answer their questions. If you can’t, you can answer that you’re not sure and you’ll get back to them. Then I can help you respond to their questions. If putting your thoughts in writing is difficult for you, I can help. I’m a fast typist and can compose a message, unique to you, for you to send. Or I can send you a summary of the issue with pros and cons so you can compose your own email, letter, or make your own phone call. 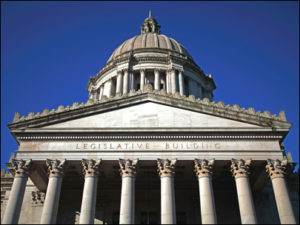 Please email me at legislativechair@wasba.org your contact information: phone number, email address, and physical address (so I can place you in your legislative district). I promise the information you send will never be shared outside the WSBA legislative committee. I prefer to communicate by email, but can work with phone numbers too. If we all participate in the legislative process, we can improve conditions for bees and beekeepers in our state. The past legislative session saw success in tax reform in favor of beekeepers. We hope to pass legislation in the coming January legislative session to conduct research improving forage opportunities for bees statewide, in cooperation with the State Noxious Weed Control Board. Future sessions will have more improvements in forage as an ongoing priority, as well as a state-of-the-art bee research lab at WSU, and new positions at that lab for research and extension outreach to beekeepers. 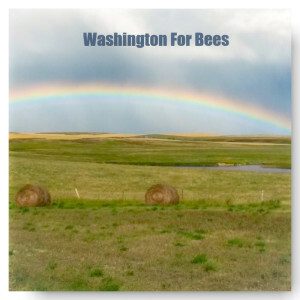 Please be a part of this effort to educate legislators and make beekeeping better in Washington.